Each year, we promise fun for the entire family. From Grandstand events and to a host of carnival rides, there is something for everyone! 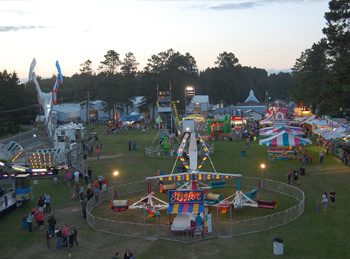 The Itasca County Fair also offers plenty of free entertainment each day and many things to see from our 4-H exhibits, Activities Building, Arts and Crafts, Children’s Barn, and Senior Citizens Day. All that plus the best fair food around! Search through the schedules and find the events you find of great interest. Please be sure to bring the required information with you when you come to the fair. The form for exhibiting cattle, goats, and sheep. The form for information about requirements for all species (including horses and poultry). The form for exhibiting poultry. This is a statement of origin form that states the birds either originated from certain disease-free flocks or have tested negative for these diseases within 90 days of the fair. All entries must be submitted online, the site will be available and live by July 15th. PLEASE PROVIDE DETAILED CONTACT INFORMATION IN THE EVENT WE HAVE QUESTIONS ABOUT YOUR ENTRIES. DATA WILL NOT BE SOLD OR DISTRIBUTED.